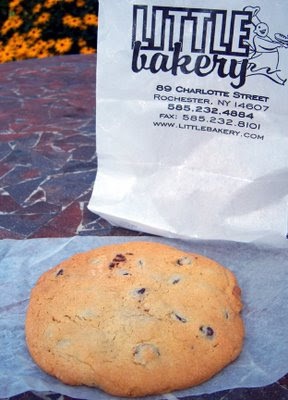 Rah Cha Chow: Best Rochester Bakery? City Newspaper, Rochester's "alternative" newspaper, recently ran the results of its voting for the Best of Rochester 2008. I found the Food and Drink winners list to be a little disappointing, just because I think the winners are the places that are the most top of mind for their categories, and not necessarily the best. But the list happened to include a few spots that have been on my backlog to write about, so this seems to be as good time as any to do so. 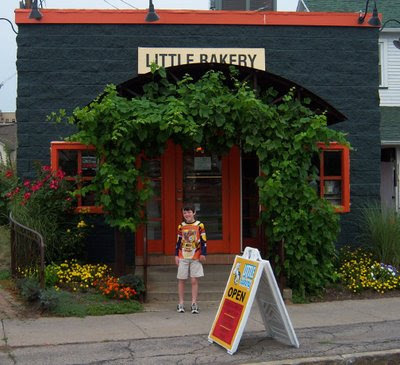 The first is the place that won Best Bakery, The Little Bakery. I had been hearing about the place for a few years but had never had reason to visit it, until my son attended a camp at the Eastman School of Music last summer. As I drove past the bakery, I almost slammed on the brakes when it caught my eye -- it is so cute! The building is, as the name implies, very little. An abundance of flowers as well as grapevines growing around the doorway, make it look quaint and inviting. Even the view from the side parking lot is cute! Inside, I was astounded that such a little building could turn out such a huge assortment of baked goods! My younger son and I stopped there twice, and both times we had a hard time deciding what to get. 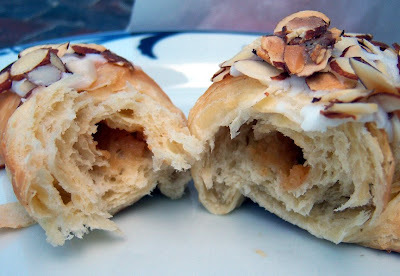 One time, I got an almond croissant, because a good, buttery, flaky croissant is hard to come by in Rochester. I am sad to say that I wasn't thrilled with the croissant. I was hoping the outside layer would be delicate, buttery and a little crispy, and the inside would be tender layers, but it had the same bread-y texture throughout. We were there on a humid day, which might have made it hard to make a good croissant, but in any case I wouldn't get one there again. The other time I was there I ordered a nutty scone. The scone itself had a nice texture -- not dry or crumbly -- but I would have liked it to be just a little sweeter. It was topped with a super sweet frosting -- almost like a fondant -- that was too thick and dense for my taste. 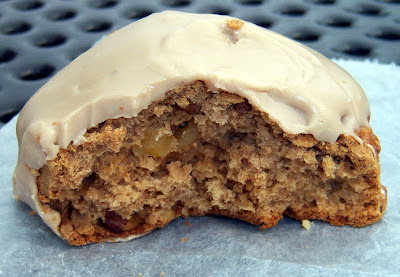 To be honest, I'd pick a Starbucks Maple Oat Walnut scone (or whatever Starbucks calls it) over that one. My son got a chocolate chip cookie, and it was just ok -- kind of skimpy on the chocolate chips. I prefer the texture and abundant chocolate chips in the chocolate chip cookies at Wickham Farms and at Elegant Expressions (both in Penfield). Another day my son got a cute flower cut-out cookie. The cookie was rolled very thin and was less sweet than most cut-out cookies I've had. 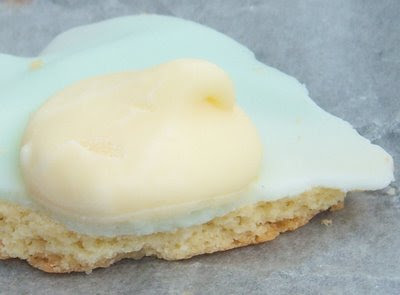 The frosting layer was almost as thick as the cookie itself and was very similar to the frosting I had on the scone. I liked the cookie but my son didn't. I love trying different bakeries. I have to say that those prices are very nice compared to my local bakeries. 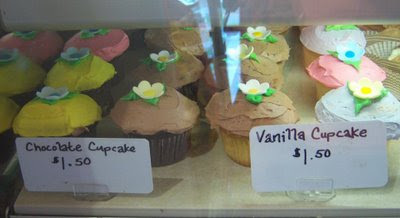 That looks like an awesome bakery...I would have gone for the cupcake...I love a good cupcake. We don't have any bakeries around here-well just one but the selection is weak. Hello. Have you ever been in Jackson's Bakery on Stone Road in Greece? Their white mountain rolls are absolutely wonderful, and when my son was working there a few years back, he brought home their chocolate fudge cake for my birthday. . . To Die For. 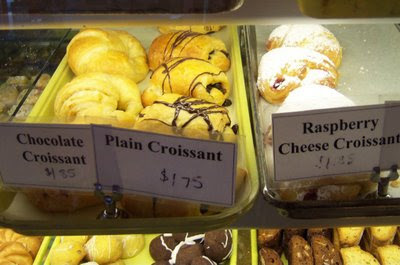 They have a nice selection of pastries, too, though my tastes usually run more toward breads and rolls. I'm going to have to stop in again - it's been too long. . .
Lisa, that's interesting ... I thought they were a little on the high end for Rochester, but I could be wrong about that. Veronica, I would have gone for cupcakes if they had something more interesting than chocolate and vanilla. The cupcake craze hasn't really caught on here. ToyLady, I'm an east sider but I have a good friend in Greece. The next time I'm there I'll have to check out Jackson's Bakery. White mountain rolls and chocolate fudge cake both sound pretty good to me! I live within walking distance of Balthazar and Grandaisy now but I miss the Little Bakery :-) I quite liked their brioche loaf and little opera torte. 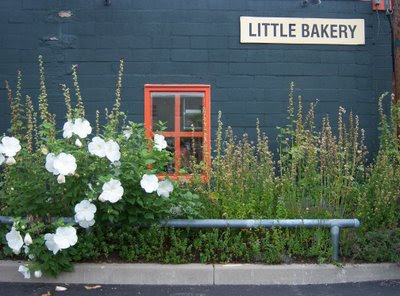 I used to get treats for my students from the Little Bakery (assorted muffins or scones). The students loved 'em. I like the bakery on Park Ave too (next to the wine shop). Smita, nice to hear from you. Hope all is going well with the new job and location. Nice to hear from you in your "anonymous" comments anyway. 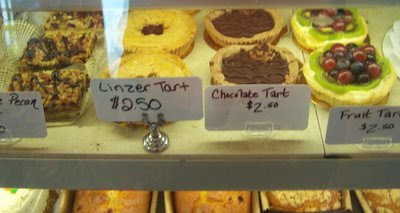 As for the Little Bakery, I know I have a lot more goodies I need to try before I really pass judgment. My son still goes down to the Eastman School for some lessons so I'm sure I'll have reason to stop by again. I have to agree with you about the Best of Food and Drink list...where are places like Rooney's, Golden Pond, Mise en Place, Corn Hill Creamery?? Anyway, I do love the bread from the Little Bakery. My favorite bakery is Richport, at the Public Market. 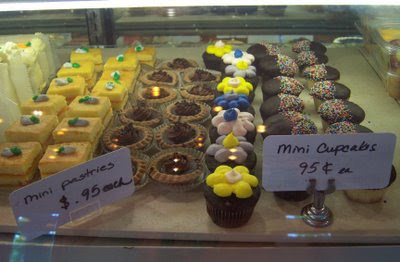 We have fallen for Goodness Cakes on University Ave in the Neighborhood of the Arts (NotA). This small bakery is run by a very friendly young husband and wife team. Their selections are unique and change regularly. Julie, yeah, it's a funny list. Even the pizza thing ... I have nothing against Pontillo's, but the best pizza joint in Rochester? I prefer Great Northern Pizza Kitchen. And I know people who rave about Cam's and also Bay & Goodman ... I also like Guida's. Pontillo's is probably the local chain with the most locations, so that's probably why it won. Man About Town, my son takes music lessons right near Goodness Cakes, and I sometimes walk Charlie when he's there. I've put my nose up to the window at Goodness Cakes and everything looks really good. I'll have to stop in and actually try something! I'll be sure to post about it if I do!